"W6XYZ" redirects here. It is not to be confused with the ABC-affiliated television station in Detroit, Michigan, WXYZ-TV. KTLA was the first commercially licensed television station in the western United States, having begun operations in 1947. Although not as widespread in national carriage as its Chicago sister station WGN-TV, KTLA is available as a superstation throughout North America via Dish Network (available only to grandfathered subscribers that had purchased its a la carte superstation tier before Dish halted sales of the package to new subscribers in September 2013), as well as on cable providers in select cities within the southwestern United States and throughout Canada. KTLA was originally affiliated with the DuMont Television Network, of which Paramount held a minority stake; it disaffiliated from the network in 1948 and converted into an independent station. Despite this, the FCC still considered Paramount as controlling manager of DuMont due to the strength of the company's voting stock and their influence in managing the network. 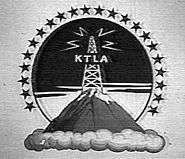 As a result, the agency did not allow DuMont to buy additional VHF stations – a problem that would later play a large role in the failure of DuMont, whose programming was splintered among other Los Angeles stations – including KTSL, KHJ-TV (channel 9, now KCAL-TV), KTTV (channel 11) and KCOP-TV (channel 13) – until the network's demise in 1956. Paramount even launched a short-lived programming service, the Paramount Television Network, in 1948, with KTLA and WBKB-TV (now WBBM-TV) in Chicago serving as its flagship stations. The service never gelled into a true television network, but during KTLA's early years, the station produced over a dozen series that were syndicated in much of the U.S., including Armchair Detective, Bandstand Revue, Dixie Showboat, Frosty Frolics, Hollywood Reel, Hollywood Wrestling, Latin Cruise, Movietown, RSVP, Olympic Wrestling, Sandy Dreams, and Time for Beany. KTLA clears the entire CW network schedule, although since the expansion of its Saturday morning newscast in May 2014, it has aired the network's children's block – currently known as One Magnificent Morning – two hours later (at 9:00 a.m.) than the network's other Pacific Time Zone affiliates. Syndicated programs broadcast by KTLA include Maury, Friends, and Two and a Half Men. KTLA aired The Bill Cunningham Show at 4 p.m. – one hour later than the network's recommended timeslot at 3 p.m. – due to its 3 p.m. newscast. KTLA has also broadcast the annual Tournament of Roses Parade from Pasadena each New Year's Day since 1948; while other local stations have also broadcast the parade over the years, KTLA remains the sole English-language outlet in the Los Angeles market to continuously broadcast the event. The station also served as host broadcaster of the Hollywood Christmas Parade, which was later syndicated to all Tribune-owned stations and the Hallmark Channel, a role it resumed in 2015 when CW received the national broadcasting rights. Channel 5 held the local broadcast television rights to Los Angeles Dodgers games from 1993 to 2001. The station would resume its relationship with the Dodgers on September 2, 2016, when KTLA entered into an agreement with Charter Communications (which had acquired Time Warner Cable's Southern California systems earlier that year through its acquisition of the latter cable provider) to simulcast six regular season games scheduled for the final two weeks of the 2016 season to which regional sports network SportsNet LA already held rights to broadcast through its contract with the Dodgers. This decision was taken after complaints were raised that fans would not be able to witness the final broadcasts of legendary commentator Vin Scully due to SportsNet LA's low market availability. KTLA also carried selected Los Angeles Lakers road games from 1967 to 1977, and as well as selected Los Angeles Kings road games during that same time period (and again selected telecasts during the majority of the Wayne Gretzky era). KTLA was also the over-the-air home of the Los Angeles Clippers for two periods, from 1985 to 1991 and from 2002 to 2009. Other than telecasts of preseason games from the Oakland Raiders (formerly known as Los Angeles Raiders until the team relocated in 1994) syndicated by the Oakland Silver and Black Network, along with a 30-minute show each weekend during the regular season before the game, KTLA does produce one sporting event each year, the LA Marathon, which features many of the Morning News on-air staff, along with running specialists on a Sunday morning in February/March of each year. KTLA presently broadcasts 66½ hours of locally produced newscasts each week (with 10½ hours on weekdays, 6½ hours on Saturdays, and 7½ hours on Sundays); in regards to the number of hours devoted to news programming, it is the highest among California television stations and one of the highest in the United States. On August 6, 2016, the Saturday KTLA Morning News expanded to four hours from 6 a.m. to 10 a.m.
Ginger Chan - Listen, bud. She's got radio-traffic blood. 1 2 Roman, James (2005). From Daytime to Primetime: the History of American Television Programs. Westport, CT: Greenwood Press. p. 15. ISBN 978-0-313-36169-2. ↑ "Golden West gets KTLA(TV) for $12 million." Broadcasting, November 4, 1963, pp. 68-69. ↑ "FCC okays Golden West purchase of KTLA(TV)." Broadcasting, May 18, 1964, pg. 65. ↑ "Autry, Signal principal players in record TV deal." Broadcasting, November 1, 1982, pp. 23-24. ↑ "KTLA(TV) to change hands in largest station sale ever." Broadcasting, April 4, 1983, pg. 131. ↑ "$510 million's the mark to beat now." Broadcasting, May 20, 1985, pp. 39-40. ↑ "FCC gives go-ahead to KTLA(TV) sale." Broadcasting, October 7, 1985, pg. 32. ↑ "Tribune Co. to Split in Two". New York Times. Retrieved July 10, 2013. ↑ Channick, Robert. "Tribune Publishing targets Aug. 4 for spinoff". chicagotribune.com. Chicago Tribune. Retrieved 23 June 2014. ↑ "This TV Clears 60%". Broadcasting & Cable. January 26, 2009. Retrieved 2009-01-27. ↑ "Charter To Simulcast 6 Dodgers Games On KTLA". TVNewsCheck. NewsCheck Media. September 2, 2016. ↑ "Durable anchor fought TV fluff". Los Angeles Times. August 8, 2007. ↑ "KTLA morning news anchor jumps ship for slot at rival KTTV". Los Angeles Times. September 5, 2007. ↑ Schneider, Michael (September 4, 2007). "KTLA's Carlos Amezcua hops to KTTV". Variety. ↑ Adalian, Josef (December 4, 2007). "KTLA replaces Fishman with Miller". Variety. ↑ Eck, Kevin (17 June 2014). "KTLA Quietly Adds 11:00 p.m. News". TVSpy. MediaBistro. Retrieved 18 June 2014. ↑ "KTLA 5 News Los Angeles | iHeartRadio". iHeartRadio. July 21, 2015. Retrieved July 21, 2015. ↑ Willon, Phil (June 2, 2009). "L.A. mayor is dating local newscaster". Los Angeles Times.